If you've been following my blog for any length of time now, you know how I love an industrial vibe in my rooms. Can't get enough. Whether it's lighting, furniture, or accessories, I LOVE throwing in some industrial-ness in the mix. And since I have boys, it's perfect since it has a masculine feel to it to begin with. So while thinking about the boys' bedroom, of course I wanted to incorporate this look throughout. And Mitch is totally on board with it too. And before I knew it, he was planning an industrial DIY curtain rod treatment. (like he doesn't have enough to do!) He found a great tutorial here from the blog Simplicity in the South. (snoop around her blog--she's got some really cool projects over there) I've seen this treatment done before and fell in love. 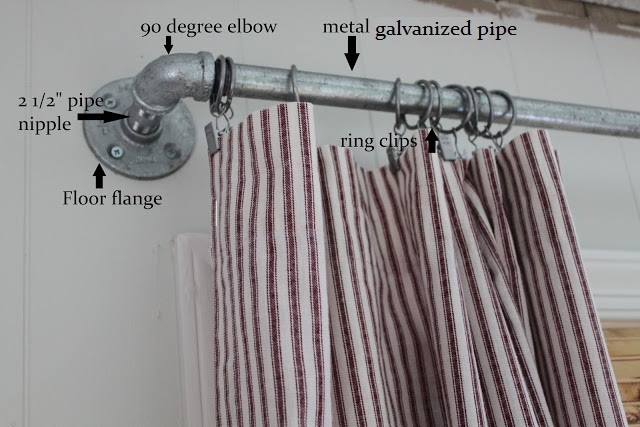 Well here's how you can make your own industrial curtain rod. Mitch got all the supplies excluding the floor flange at a local hardware store. (You can pretty much find them at any Lowes, Home Depot, etc) The floor flanges were about four times the price than what Amazon sells them for. So of course we ordered ours through Amazon. After he cut it to size, Mitch took the pipe into work and had his maintenance buddies re-thread it for him. You can have this done at a plumbing or machine shop, if you don't happen to have any maintenance buddies:) Then it's just a matter of measuring, making sure everything is level, and screwing your flanges into the wall. Mitch screwed ours into studs for more support (this is the boys' room after all...they like to hang from stuff). Oh and make sure you slide your ring clips on before you hang the rods. So that's it. Easy project that looks great. And I love how the rings slide so easily across the pipe. There's no connecting rods for them to get hung up on so it's a breeze pulling the curtains shut. Oh and the curtains were a recent GW find. They were $5 for two panels and I thought they would be perfect in this room. Yay for deals! This project cost us about $60 for all the parts/supplies for two windows. We love how they turned out. I know you're probably anxious to see the rest of the boys' room--we're getting there! Hang on. Just a little while longer! Yes, we saw that ceiling and Mitch would LOVE to do that in the boys' room. That WAS what we were thinking. But alas, corrugated metal isn't cheap (we like the rustic/used kind). We were looking around on Craigslist for some, but it still would have been a chunk of change. We have another idea that involves free wood (not pallet wood) so if we can pull that off, we have high hopes it'll look sweet. But that's kinda on the back burner for now as we have a whole house to finish:/ Too many project/too little time! It looks great! Glad my post inspired you! The ticking stripe curtains go perfectly with the industrial vibe also! These rods are so flippin' cool! We're getting ready to reno a farmhouse and I think this look would be fantastic to add a touch of industrial. Very creative, Kat! looks awesome! I love it!